The iPad can be a brilliant motivational tool for children in the classroom. The ease-of-use, coupled with the speed that you can get results means that it can be the perfect tool for integrating into your literacy planning. And, as many schools don’t have 1:1 tablet computers it can also mean that the collaborative and group aspect of the technology can be harnessed. I’ve been working with teachers who are developing the writing process in an attempt to motivate their boy writers. We have been looking at the writing process and working out where the enthusiasm lags, or where skills need developing. This part of the process is important, reflecting on why the children are stalling, or on what the challenges might be really helps the planning process. Finally we looked at what apps the schools have, what apps the teachers are confident with and, most importantly, what apps would support the different ‘stumbling blocks’ the children face. 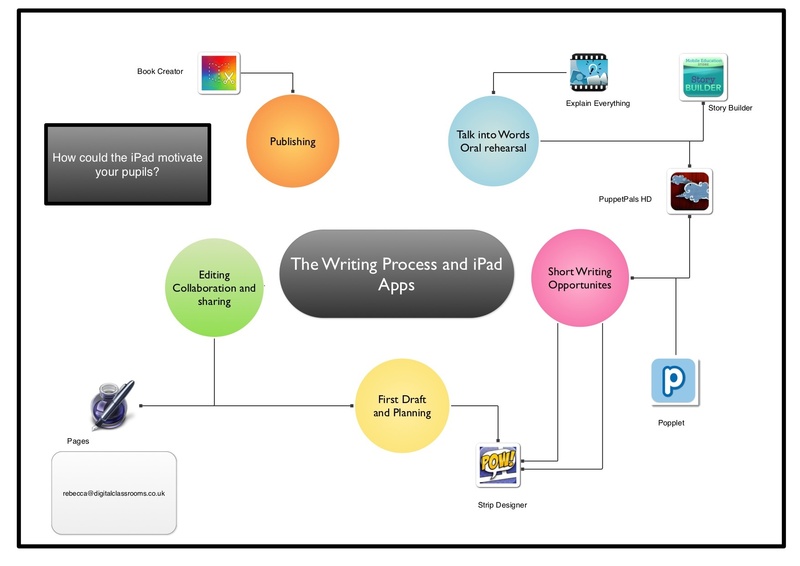 The writing process with the apps we identified. A first look at the planning and the use of the iPads in the classroom is encouraging. As an example, the children found using Popplet very easy to share ideas, vocabulary and to create branching plans. It could be used for a quick ten minute burst, rather than being the point of the lesson. Explain Everything can also be used to develop ideas, or rehearse their writing, photographing and then reading their work into explain everything proved the perfect way to start a discussion about punctuation! It created lots of classroom talk and allowed for plenty of short writing opportunities. Teachers were able to use the iPads during ordinary classroom planning, allowing for some really quick and professional looking work created. Enthusiasm and engagement really were the key, with the children beginning to ask if they could create their work in a certain way, or if they were able to use an app to demonstrate their learning and their work. 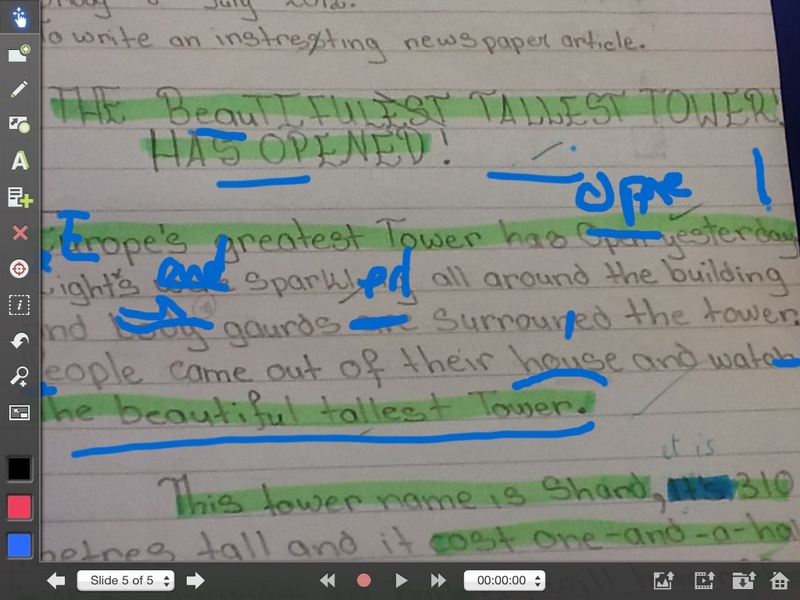 Some of the apps required greater lesson time, but it paid off with their writing. For example, ‘PuppetPals HD’ would be planned in a standalone lesson, developing dialogue, or looking at character. But giving the children access to the iPad for the writing session meant that they were then able to refer back to their planning, or back to their dialogue show and then use the vocabulary in their writing. Peer asses work in Explain Everything. It’s interesting to see the iPads being used as part of a ‘workflow’ – there is no doubt that the iPads are designed as a 1:1 device. Many schools don’t have the capacity for 1:1 but have nevertheless invested and it’s encouraging to see them being used in such a productive manner. This short trial with writing has shown the capacity for teachers and pupils to use the technology. Posted by RS on February 6, 2013 in iPad, Literacy and tagged apps, classroom, iPad, writing.